Moonlight and Shadow - Shades of light and dark blue with bubbles of gray and black reflect the night shadows from the glowing moonlit sky. -Comes uniquely wrapped and all ready to receive as a gift. If you would like to include a greeting card please let me know and I would be happy to include one. 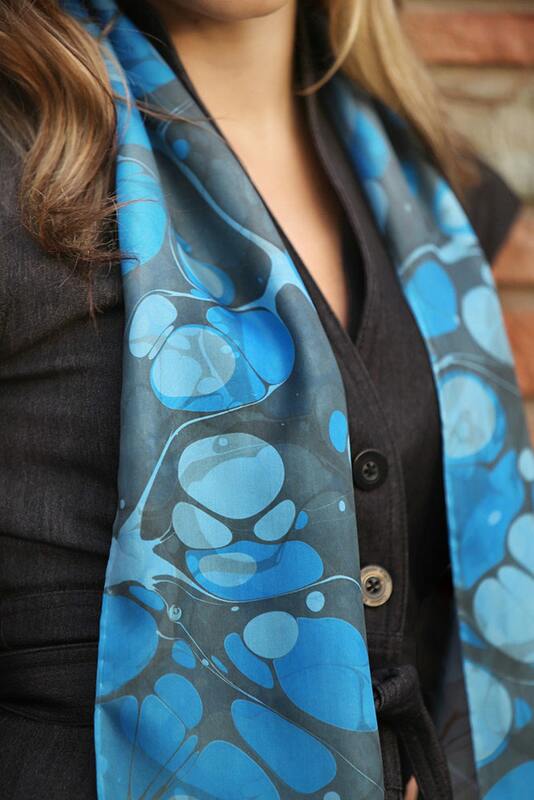 -Your scarf is 100% silk and each piece is individually hand-dyed and hand-marbled. The scarves pictured on the web site are representations of a specific pattern and color theme that we have created. However, because the scarves are individually hand-marbled rather than being mass-produced, no two scarves can ever be identical.